Thai and Cambodian lawyers are making their cases for Preah Vihear Temple in The Hague this week. PREAH VIHEAR – In the dusty frontier town of Sra Em, 27 kilometers from the Thai border and the disputed Preah Vihear Temple area, the sense of Cambodian nationalism is perhaps more palpable than anywhere else in the country. In the many restaurants and beer gardens that line the town’s two roads, off-duty soldiers drink to chants of “Preah Vihear! Kampuchea!” Army camouflage is en vogue, with caps, vests and other military attire donned proudly by the town’s residents. 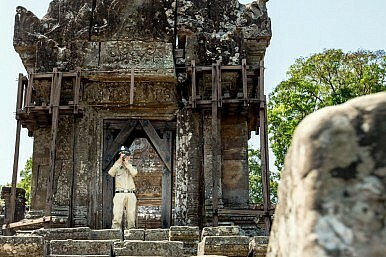 A tourist policeman at the temple ticket office wears a hat emblazoned with “ICJ 1962” – a reference to the International Court of Justice verdict that recognized Cambodian sovereignty over the temple more than 50 years ago. The temple itself – a magnificent, crumbling Angkorian wonder perched atop a cliff in the Dangrek Mountains – was placed within Cambodia borders on French colonial maps dating back to 1907. These maps were used successfully by the Cambodian delegation at the 1962 hearings – the results of which have long been a sore point for Thai nationalists. In 2008, Cambodia ignited a tinderbox in Thailand, applying to have the temple listed as a UNESCO World Heritage site as political turmoil engulfed its northerly neighbour. Clashes occurred on the border and continued intermittently for the next few years, culminating in intense fighting in 2011 that left 18 dead and thousands displaced. Thailand does not dispute Cambodia’s claim to the temple, but both sides are now contesting 4.6 square kilometers of adjacent land at the ICJ after Cambodia requested an interpretation of the original ruling in 2011. Without an ICJ verdict, there could be “unfortunate consequences which would prevent the two states from living in a friendly, peaceful and cooperative environment,” Cambodia’s Foreign Minister Hor Namhong told the court at the opening of proceedings on Monday. With troops remaining entrenched on both sides of the border, local residents say they will wait for government orders to evacuate if fighting breaks out again. But on the ground, the situation is tense. Cambodian pillboxes buttressed with sandbags dot the foothills around the temple, while army encampments and garrisons line the steep climb up the mountain and idle soldiers lie in hammocks with their guns, eyeing their counterparts through binoculars. A Thai flag flaps on a hill opposite the temple, in viewing distance from the ruins of the ancient sacred site, apparently damaged from shelling in 2011. A Cambodian policeman at the temple points to the dense jungle on the Thai side of the border: “The Thai army. They are waiting there,” he said. In recent days, ultra-nationalist Thai groups have held rallies on their side of the border to protest the ICJ hearings. By contrast, Cambodians are “quietly confident” that the verdict will be favorable, and in any case, trust the court and are likely to abide by its’ final decision, according to independent Cambodian political analyst Lao Mong Hay. This raises the prospect of renewed violence when the court delivers its verdict later in the year. Relations between the two countries have dramatically improved since mid-2011 when Yingluck Shinawatra, sister of exiled former Thai Prime Minister Thaksin Shinawatra, became Thailand’s first female PM. Thaksin, whom many believe pulls the strings behind his sister’s government, is a close friend of Cambodian Prime Minister Hun Sen.
“One side of the Thai political divide exploited Cambodia’s temple listing [in 2008] and turned it into a principal plank to derail a pro-Thaksin government at the time,” he said. Thaksin’s proxy government, led by Samak Sundaravej, was forced to withdraw support for Cambodia’s UNESCO application after royalist-nationalist political forces and their “yellow-shirt” supporters claimed the government was sacrificing Thai sovereignty over the temple. The best possible outcome from the ICJ is an ambiguous verdict that leaves the 1962 agreement as a guide, according to Dr. Pongsudhirak. “This would force the two parties to work out an arrangement, which is possible now that a pro-Thaksin government that gets along much better with [Cambodian] Prime Minister Hun Sen has reclaimed electoral power in Thailand,” he said. But if tensions do spiral out of control following a verdict, intervention by ASEAN could be key. “ASEAN’s role will be salient after the ICJ decision, which will test ASEAN’s mettle as a regional organization,” he said. As a “patron of Cambodia and close friend of Thailand,” China could also help diplomatically if a bilateral conflict were to arise, he added. Both nations have sent teams of world-class lawyers to The Hague, armed with maps, documents and pages of oral testimony that will be delivered to the court. Cambodia opened proceedings earlier in the week, using the colonial-era maps as the basis for their main argument, while Thailand responded on Wednesday, contesting the validity of the maps and the jurisdiction of the court to rule on the border demarcation. Any decision from the ICJ will be final and legally binding, with no chance for appeal. The prospects for all-out conflict at this point remain slim but it is questionable whether either proud nation will accept the humiliation of defeat in six months time when the court is expected to deliver a verdict. The dispute could then drag on, and remain susceptible to the domestic political posturing that has proved dangerous in the past. Unanimous decision in favor of Cambodia’s claim to surrounding temple grounds.